The best exhibition to date of Smithfield Fair's ability to merge traditional songs and new original works with passion and warmth and energy, this album also features exquisite playing from the great Scottish fiddler John Taylor. Continuing on with the band is guitarist/co-producer J. David Praet and, once again, stalwart support on bass, vocals and percussion from Bob Smith. 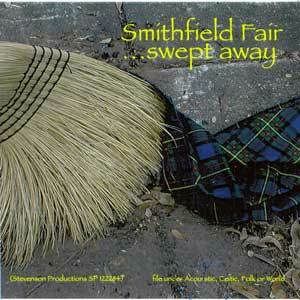 A chance once more to close your eyes and return to the Highlands as Smithfield Fair continues its forward motion. Mull of Kintyre (Sir Paul McCartney/Denny Laine), Wild Mountain Thyme (Trad., Robert Tannahill), Swept Away (Jan Smith), A Fine Homecoming Day (D-B.Smith), Greyfriar's Bobby (Jan Smith), Mingulay Boat Song (Trad., Sir Hugh Robertson), Bonnie Banks of Loch Lomond (Trad. Lady John Scott), Mist Covered Mountains (Trad., John Cameron), Will It Be The King? (D-B.Smith), Annie Laurie (Trad., Douglas of Fingland), The Last Thing On My Mind (Tom Paxton), Fareweel, Argyll (D-B.Smith), and Hauling Angus (D-B.Smith).